Joined by two other teams of climbers, including professional guide and climber Scott Fischer (Jake Gyllenhaal), who has a large group of climbers in tow too, as apparently lots of people want to experience the thrill of paying $65,000 to meet with almost certain death…. Planned down to the time and hour they will ascend and descend from THE BEAST, our climber’s head for glory, one footstep at a time. 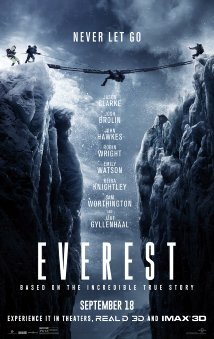 I give EVEREST a rating of: THIS FILM IS A MUST SEE ON THE BIG SCREEN ~ and in IMAX 3-D TOO!!! Well, you know going in what is about to take place, and that there is no way that someone isn’t going to perish right before your very eyes. But, with that said, EVEREST is A CINEMATIC MASTERPIECE of EPIC PROPORTIONS! And talk about a high profile cast – how many more actors could have signed on to get the you-know-what beat out of them day, after day, while shooting this film. And surprisingly, even with all these famous actors in one place, at one time, this movie has the depth and enormity to let each one shine in their own right. I must share too, in all fairness, there were a few storylines that I wish they would have finished, as we left way too many people behind that were tragically lost amongst all the breathtaking beauty, but, there is no way that I could suggest you catch this film on DVD, because if you really want the experience that is EVEREST – YOU HAVE TO SEE IT ON THE BIGGEST SCREEN THAT YOU CAN FIND!! !